The seventh annual Oxford Kinetics Festival, "Circus Fracas," will be held noon-5 p.m. Sunday, April 17, at Millett Hall. The festival — free and open to all — includes activities for all ages. Special appearance by the Wright "B" Flyer, a look-alike of the world's first production airplane, the Wright Model B (weather permitting). Many hands-on workshops, including build your own kite, build a rocket from a recycled soda bottle and make a "fender-blender" smoothie. Demonstration and performance by the My Nose Turns Red youth circus. 3:30 p.m.: Special performance of "Luigi Bullooney's Circus Menagerie" by regional puppet artist Jesse Mooney-Bullock. 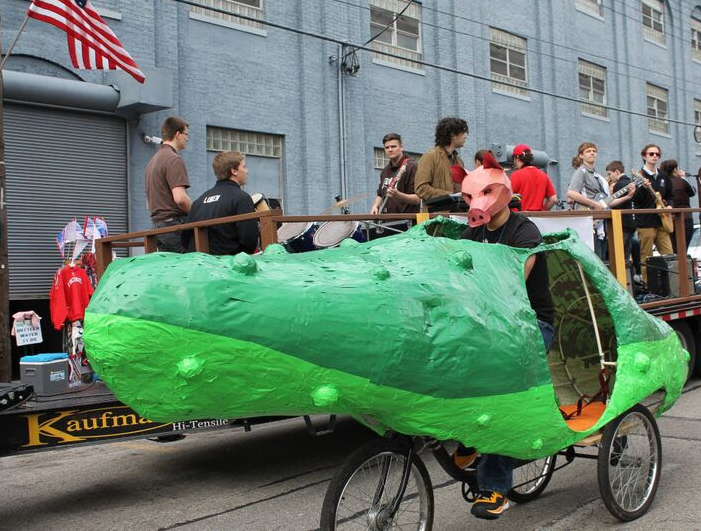 The chip bag and pickle bikes debuted at the Cincinnati Reds Opening Day parade last week (see below). Students from the Miami Film Society will capture the festival on video. Check out the RV with the flat screen on the outside: students there will show you how to submit your own cell phone or Go Pro video footage of the festival. Students will edit all footage into one final film to be screened at the end of the event. Watch the stop animation films created by the Kramer Elementary School and Miami students of Big Brothers Big Sisters of Butler County. Back by popular demand: Food trucks include the Columbus-based Kinetic Food Truck, "gourmet food truck for the health-concious"; Timmy's Meltdown; wood-fired pizza; and the Red Sesame Korean barbeque, among others. Register for one of these races. Each involves a series of circus-themed “challenges” during the course. An awards ceremony will be held during the festival. The Scramble is for kids under the age of 18 and family teams. The Scramble is "part parade, part race, part obstacle course and all fun." Registration required. Register here. The Dog's Breakfast: 12:30 p.m.
For ages 16 and older, on human-powered contraptions. Riders will have to check in at four stations and complete a variety of challenges before heading to the finish. Registration required. Register here. Kate Carlier Currie is the executive director and co-founder of the nonprofit MAKETANK Inc., which conducts the Oxford Kinetics Festival. She is a sculptor and a graduate student in transformative education at Miami. She designs and manages several after-school STEAM (STEM + art) education programs. She is developing after-school STEAM programs for Miami’s Urban Teaching Cohort program to implement next year. Rod Northcutt is associate professor of art and co-founder of MAKETANK Inc. He is a social sculptor whose collaborative practice connects artists, designers and students with multiple social groups to address social challenges, connect community members, share skills and build creative confidence. This week Northcutt received the Ohio Campus Compact David Hoch Memorial Award for Excellence in Service in recognition of his work in service learning and civic engagement. For photos above: Carlier Currie and Northcutt held weekly workshops this spring with boys from Changing Lives Youth Services group home in Cincinnati to create pedal-powered sculptures. Look for them at the festival. 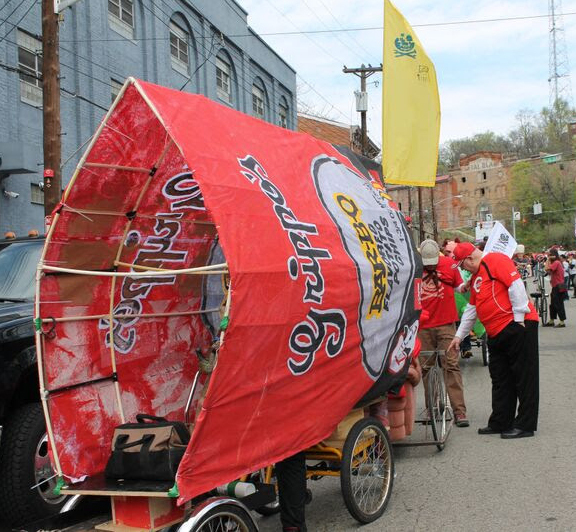 The chip bag and pickle bikes debuted at the Cincinnati Reds Opening Day parade last week. Festival sponsors include the College of Creative Arts, Oxford Community Arts Center, Talawanda School District, city of Oxford, Oxford Visitors Bureau, Oxford Community Foundation, Butler Rural Electric Cooperative, Wire & Twine (poster creation) and Artswave. 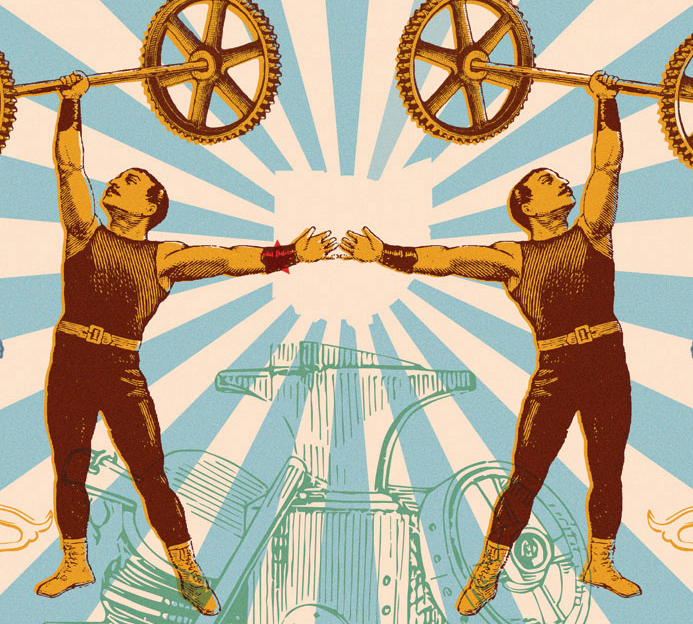 Cirque Mechanics “Pedal Punk” performance, 7:30 p.m., April 13, Millett Hall. Students from Pepper Stetler’s art classes. Cirque Mechanics will hold workshops with Talawanda high school and middle school students; Miami’s arts management students will meet with them about the artistic origins of their company. Students from the Miami Film Society will screen a variety of circus-related films. April 14: 7 p.m., ART 100, "Moulin Rouge." April 15: 7 p.m., Oxford Community Arts Center, Fellini's "La Strada." April 16: 8:3- p.m., Uptown Parks, Buster Keaton's "Sherlock Jr." and "Seven Chances." Build Your Own Skateboard workshop, run by Station North Tool Library of Baltimore; register here for the few remaining spots. Blacksmithing workshop, noon-5 p.m., Millett Hall grounds, for ages 16 and older; register here.